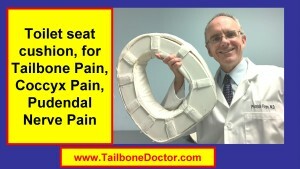 Some patients find that the most comfortable place to sit is to sit on a toilet seat. 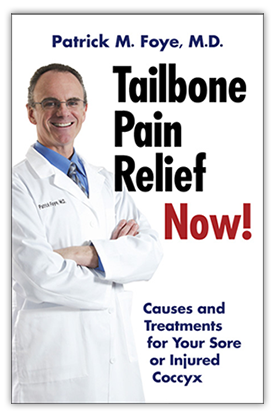 This is true for some patients with coccyx pain (tailbone pain, coccydynia). This is also true for many patients with pudendal nerve pain (pudendal neuralgia). Where can you get a Toilet Seat Cushion? You can buy a toilet seat at many hardware stores or home improvement stores. 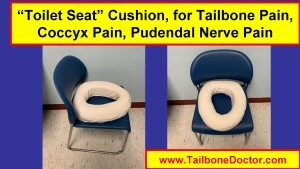 Some patients will add additional padding to make the seat more comfortable. Some patients will add fabric or another covering, so that cosmetically it does not look like a toilet seat. Here is a video where Dr. Foye displays a Toilet Seat Cushion and talks about why it can be helpful for some patients with Tailbone Pain, Coccyx Pain, Coccydynia, Pudendal Nerve Pain, Pudendal Neuralgia.